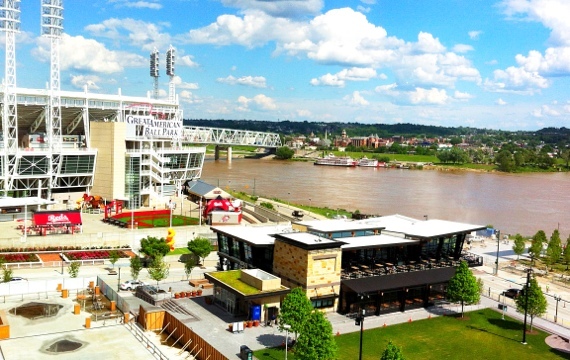 CINCINNATI – The shoreline of this Ohio River city, which thrived in the 19th century with 30 steamboat visits a day and then died in the 20th as pollution and industrial disinvestment pushed people and businesses inland, is emerging again as a new hub of civic and economic vitality. The New York Times published my article on Cincinnati’s riverfront development, more evidence of the Ohio River Valley’s new upward economic vector. The Times piece is a shorter version of this draft. Last year, Great American Insurance Corp. opened a $322 million, 800,000-square-foot office tower close to the river that now rules the city’s skyline. Two blocks in front of the 41-story building, the city and Hamilton County are constructing a $120 million riverfront park. It steps up from the shoreline in successive tiers of grass and stone to meet The Banks, a $600 million, 18-acre mixed-use retail, residential, and entertainment development. In addition, Rock Gaming is building a $400 million, 354,000-square-foot casino downtown that is scheduled to open in early 2013. And in February this year the city started construction on a $112 million, 2.6-mile streetcar line that will link Cincinnati’s business center, and historic Over-the-Rhine residential and entertainment district, to the new riverside park and The Banks. Cincinnati’s economy and its capacity to attract new residents and jobs reflects several converging market trends. The University of Cincinnati, the city’s big public university, has significantly rebuilt its campus in recent years, attracting more students and national attention, and serving as the foundation of an expanding medical research and health services industry. A growing number of independent and innovative marketing and branding companies, many focused on online markets, are developing with the help and through various collaborations and partnerships with Procter and Gamble, the city’s consumer products mainstay. And upriver from Cincinnati, billions are being invested by the energy industry to develop deep shale gas and shale oil reserves, reviving the state’s steel industry, generating a new petrochemical sector, producing thousands of new jobs, and strengthening urban economies from Pittsburgh to Cincinnati. Digging out from decades of disinvestment is no small goal for a river city that from its founding as a western frontier outpost in 1788 grew by 1950 into an industrial powerhouse of nearly 504,000 residents. But since 1960, as the metropolitan region expanded to more than 2 million people, and globalization drained manufacturing jobs, Cincinnati, which endured three days of riots in 2001, has been losing an average of 4,000 residents annually and median household incomes are well below the state and national averages. 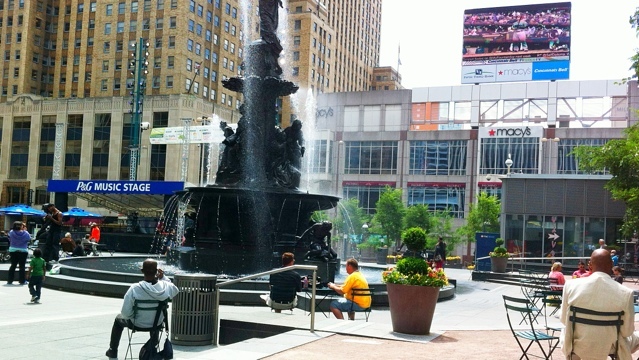 Still, with 80,000 downtown jobs, Cincinnati’s business core is thriving. And with nearly 300,000 residents, 10,000 of them living downtown and now on the waterfront, Cincinnati remains the third largest city along the six-state, 981-mile Ohio River, behind Louisville and Pittsburgh. Like its bigger neighbors, and several smaller Ohio River cities including Marietta, Ohio, Owensboro, Ky., and Evansville, Ind., Cincinnati is experiencing a strong revival in urban core business and residential growth, much of it prompted by development along a scenic river that state and federal water quality data shows is cleaner and more ecologically vital. On a bright blue afternoon, just the sort of day that prompted Alexis de Tocqueville in 1831 to describe this part of the Ohio River as “one of the most magnificent valleys in which man has made his stay, ” the full sweep of Cincinnati’s new development, clearly designed as the city’s gateway, comes into full view. Construction workers laid stone walkways and new sod in the shoreline park. Alongside, on the upriver end of an 18-acre expanse of grass, walkways, new streets, and pocket parks are the first two buildings of The Banks that opened last year. They are sleek six-story brick and glass buildings, built at a cost of $82 million, that encompass 80,000 square feet of ground floor restaurant and retail space below 300 rental apartments. The $78 million second phase of The Banks, which is being built by Carter, an Atlanta-based real estate investment firm, is set to begin construction next year. It consists of one more mixed-use building of similar size, a $25 million expansion of an underground parking garage, and the announcement this month that Yard House, a Los Angeles company, will construct a separate 11,000-square-foot restaurant. Piece by piece, a new neighborhood is taking shape. It combines an old riverfront economic concept based on housing, entertainment, travel, and tourism with a new 21st century focus on the value of professional sports. Located between the two phases of The Banks is the $110 million, 158,000-square-foot National Underground Railroad Freedom Center, which opened in 2004 and was visited in February by First Lady Michelle Obama. Flanking the entire development, to the east and west, are Cincinnati’s professional sports stadiums – the Cincinnati Bengal’s $455 million Paul Brown football stadium that opened in 2000, and the $337 million Great American Ballpark for the Cincinnati Reds that opened in 2003. The construction of The Banks and the 45-acre shoreline park follows more than a decade of significant infrastructure investment along Cincinnati’s riverfront, much of it financed by a one-half cent sales tax approved by the city and Hamilton County voters in 1997. Revenue from the tax supported a $322 million highway modernization that narrowed the Fort Washington Way expressway between the river and the central business district. Engineers shortened the overpasses over the sunken freeway, making it much easier for pedestrians to reach the river from downtown. The tax also supported the new football and baseball stadiums, and the construction of a $120 million, 5,500-space underground parking garage that is designed to withstand the river’s periodic flooding and serves as the out-of-the-floodplain dry pedestal on which all of the new construction is perched. Laura Swadel, a vice president at Carter, explained in an interview that putting so many built assets together along an impressive river is proving to be very attractive to businesses and residents. She said the development’s retail space is 92 percent leased, and there is a 66-person waiting list for the one- and two-bedroom market rate apartments, which rent for $1,600 to $1,700 a month. When it’s fully built out, which will take most of this decade, The Banks will consist of 1.5 million square feet and 1,200 residential units, 400,000 square feet of retail space, and 400 hotel rooms. The cost of construction, she said, was estimated at $600 million. “We’ve found that people want to live here and spend their time in this kind of environment,” she said. This, of course, is not a new role for the Ohio River, a source of water, resources, and transport for the population growth, jobs, and industrialization that built 20th century America. It’s just that during most of the last two generations the Ohio River Valley was warped by deindustrialization, disinvestment, depopulation, and all manner of economic and environmental deterioration. By the early 1990s one of the rare new industrial facilities under construction along the entire river was a toxic waste incinerator next door to an elementary school that was built upriver in East Liverpool, Ohio. Those decades of decay are steadily giving way to a new era of dynamism in the Ohio River’s big cities. Unemployment in March in Cincinnati was 7.6 percent, lower than the national average. Indeed, on April 5, the Cincinnati Reds’ opening day, the city and The Banks held a block party that attracted a crowd estimated by city officials to number 140,000 fans, most of them clad in the team’s signature red and white jerseys, caps, and jackets. People crowded the new streets outside the Great American Ballpark and stood shoulder to shoulder in the district’s new bars and restaurants.